Top 25 Diet Bloggers To Follow in 2016! There are some accolades in life that come with prediction and then there are those that come as a total surprise. This one, “Top 25 Diet Bloggers to Follow in 2016!” was tossed in my direction as a totally unexpected surprise. This very website has served as a vessel in which I share some of the very things in life I enjoy most, like cooking, recipes, delicious paleo meals, helping others and sharing advice at all levels of importances. Then there’s the influx of people who email me weekly and those that have stayed connected and committed as followers. Not to mention, the many people and companies that reach out to me for my help. I love it all! This is what I woke to this week, “To say that Tina is an avid foodie would be a gross understatement. She combines the best of multiple fields into the fusion that is her blog by way of living the paleo lifestyle, developing her own recipes, collecting cookbooks, peppering her blog with glossy-media level food photography, writing, teaching and consulting.” Wow! After so many years of physical troubles while raising my three adorable healthy children, I was finally diagnosed with a severe gluten intolerance: celiac disease. I dove into this arena head first working with many in this field from MDs, research scientists, food companies, authors, you name it. I was involved. I wanted to ensure no one, and I mean no one would go through what I had no matter the age. Then after several years of this I knew that the standard gluten-free diet was not working well enough for me like it was for so many others. It was a real lousy realization to be honest. By now I had a multi award-winning website, and one that was really thriving and helping SO many, GlutenfreeHelp.info. Shortly after this epiphany I came across the SCD (specific carbohydrate diet) while reviewing several cook books. This led me to GAPS and eventually the paleo diet, or in very simple terms the concept of no grains or legumes and the actual science behind why one should refrain from them. My daughter as well as my oldest child were diagnosed with celiac disease. My daughter started to work intently on the gluten-free website helping many others with her own passion to help families, moms and children. This enabled me to delve into paleo and spread my wings in many areas. My new paleo website, PaleOmazing was soon honored as a Top Resource Website and now…. 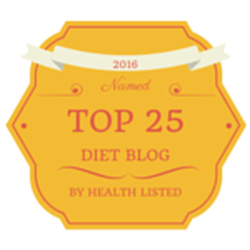 Today’s accolade, in which I was featured as one of The Top 25 Diet Bloggers To Follow in 2016!